When biomass power stations burn fuels, valuable fly ash is produced as a by-product. This ash typically gets disposed of in landfill sites. Biomass power stations are marketed as environmentally friendly options, but the utilisation of the by-product has been forgotten. For renewable biomass energy sources to be renewed, the original nutrients should be returned to nature. Bio fly ash is an excellent ash fertiliser. Ash fertilisation is a great investment in nature and one of the most profitable investments for forest owners. Positively utilising ash has many benefits and there is a good market for doing so. We help energy producers to turn their by-product streams into revenue streams and sustainable business. Making good use of fly ash is not simply a matter of turning powdered ash into granules – it is a series of steps through which fly ash becomes a marketable product that can eventually be spread in forests as fertiliser. Tightening environmental regulations and laws require power stations to use and recycle the by-products of the combustion process. Disposing of ash in a landfill site creates extra costs for the energy producer. 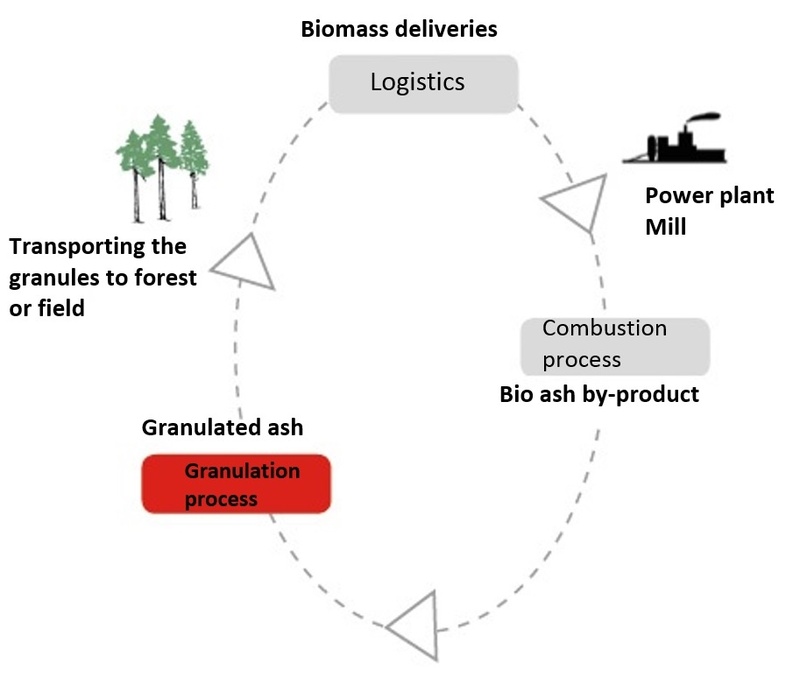 By productising the granular ash and selling it as fertiliser to the same forest owners who supply the fuel to the power station, costs are turned into revenue. Fly ash fertiliser is competitive alongside industrially produced forest fertilisers. Fly ash granules are created locally to the forest owners, so the fertiliser does not have to be transported far. Turning ash from a waste by-product into forest fertiliser is a practical example of sustainable development and environmental responsibility. The environment benefits when landfill waste is lessened and natural nutrients are returned to nature. The local community is also supported, as new jobs are created and the sustainable development of the whole region is furthered; as well as producing energy locally, environmentally friendly fertiliser is also produced locally. Environmental awareness, community values and positive publicity are strong marketing factors. Tecwill’s granulator systems can be situated in the immediate vicinity of combustion plants. The fly ash is fed from the ash silos into the special mixer using screw conveyors. The ash is mixed with water according to the prescribed recipe, creating a suitable mixture. The moist ash mix is fed into the granulator disc, where granulation occurs as a continuous process. Ash granules can also be fortified with additional nutrients, if required. A suitable composition of added nutrients can be determined according to the composition of the ground to be fertilised. Once formed, the ready granules are transported by conveyor belt to an interim store, transport container or a packing station, ready for the next stage.